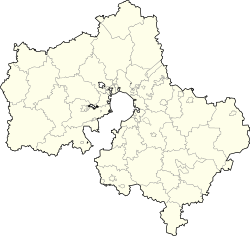 Shchyolkovo (Roushie: Щёлково) is a ceety an the admeenistrative center o Shchyolkovsky Destrict in Moscow Oblast, Roushie, locatit on the Klyazma River (Oka's tributary), 42 kilometers (26 mi) northeast o Moscow. Population: 110,411 (2010 Census); 112,865 (2002 Census); 109,255 (1989 Census); 91,000 (1977). It dates back tae the 16t century. Toun status wis grantit tae it in 1925. It is reachable bi suburban trains frae the Yaroslavsky Rail Terminal o Moscow. ↑ 1.0 1.1 Roushie Federal State Stateestics Service (2011). "Всероссийская перепись населения 2010 года. Том 1" [2010 Aw-Roushie Population Census, vol. 1]. Всероссийская перепись населения 2010 года (2010 Aw-Roushie Population Census) (in Roushie). Federal State Stateestics Service. Retrieved June 29, 2012. This page wis last eeditit on 8 Mairch 2018, at 06:34.